The Drakensberg Pumped Storage Scheme is an energy storage facility built in the South African provinces of Free State and KwaZulu-Natal starting in 1974 and completed by 1981. 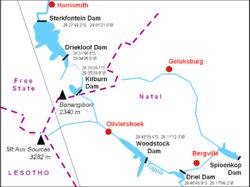 Four dams are involved in the scheme; the Driekloof Dam (joined to the Sterkfontein Dam), the Kilburn Dam, the Woodstock Dam and the Driel Barrage. Electricity generation equipment is located between Driekloof Dam and Kilburn Dam. Since the Driekloof Dam/Sterkfontein Dam also forms part of the Tugela-Vaal Water Project some of the water pumped to Driekloof Dam might end up flowing to the Vaal Dam and not be available for return to the Kilburn Dam. The Woodstock Dam and Driel Barrage are used to supply this additional water to Kilburn Dam when required. The scheme provides for up to 27.6 gigawatt-hours (99 TJ) of electricity storage in the form of 27,000,000 cubic metres (950,000,000 cu ft) of water. The water is pumped to Driekloof during times of low national power consumption (generally over weekends) and released back into Kilburn through four 250 megawatts (340,000 hp) turbine generators in times of high electricity demand. 1 2 "Drakensberg Pumped Storage Scheme" (PDF). Eskom. October 2005. Retrieved 2008-11-09. 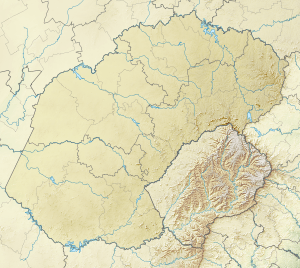 ↑ "DRAKENSBERG PUMPED STORAGE SCHEME". Eskom. Archived from the original on May 9, 2008. Retrieved 2008-11-09. 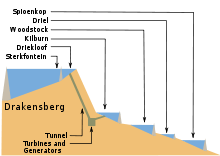 ↑ "General Layout of Drakensberg Pumped Storage Scheme" (PDF). Eskom. Retrieved 2008-11-09.